/ Modified may 5, 2010 2:57 p.m. In 1933 the rupture caused and even greater rift between the city of Tucson and those living in the unincorporated area south of the downtown. Tucson's solution was to annex the area and assess residents along south sixth avenue to pay for the repairs. Lawsuits were filed on behalf of both parties, while repairs went forward. Finally, in May of 1936, by a vote of 52 to 35, the town of South Tucson incorporated. Richard Salaz recalls growing up in South Tucson in the 50's, one of ten siblings. He says they made a noisy bunch at family fiestas. "You'd have twelve people talking and not one was listening to any of the others. It was funny," says Salaz. Salaz says in those days the city had few resources, and he and his pals played ball in vacant lots. But he remembers a happy childhood where everybody knew everyone else. "We grew up with our neighbors," Salaz says. "There was a nice family atmosphere and people talked to each other. It took a broken sewer line along South Sixth Avenue to unite the citizens of the City of South Tucson. In 1933 the rupture caused and even greater rift between the city of Tucson and those living in the unincorporated area south of the downtown. Tucson's solution was to annex the area and assess residents along south sixth avenue to pay for the repairs. Lawsuits were filed on behalf of both parties, while repairs went forward. Finally, May of 1936, by a vote of 52 to 35, the town of South Tucson incorporated. Salaz has spent his working life at city hall, where the small government requires him to wear many hats. He serves as the director of three departments, planning and zoning, human resources and transportation and flood control. Yet he says the small size of the municipality grants greater access to the people who live here. According to Salaz, "when you’re talking to any one of us you’re prob talking to a decision-maker." Salaz says the city has worked hard to make it easy to do business. A recent influx of stimulus dollars will begin a paving project that when finished, will mark the completion of all infrastructure improvements begun five years ago. The city is offering incentives for business to come to the area, and unlike it's much larger neighbor, South Tucson has fewer layers of bureaucracy and generally can turn plans around within two weeks. Tom Boyle has operated his buisiness in South Tucson since 1979 and has become one of the city's biggest boosters. He works with colleagues to rebrand the city's image, one he says is too often viewed as unsafe and corrupt. "The reputation has tainted people’s opinion of a city that’s very finely run, and the people and the culture is magnificent," says Boyle. The gem show has no interest to come to the City of South Tucson, because of fear of security." South Tucson Police Sgt. Edward Cajas concedes that in days past the city of South Tucson had more than it's fair share of crime. The proximity to Interstate 10 and the county jail put many unwelcome visitors on city streets. 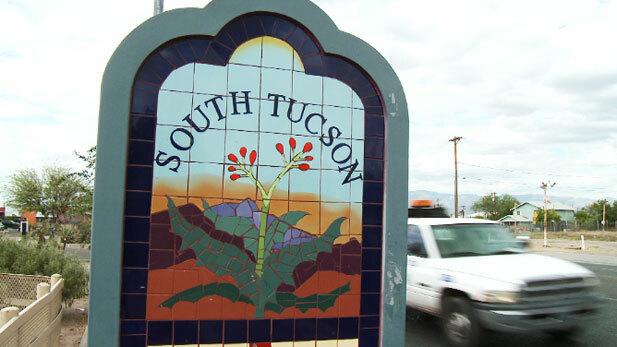 But he says people too often people think of the City of South Tucson when they hear reports of criminal activity in south Tucson. "That bothers me, and my goal has always been to try to change that misperception of our city," Cajas says. "It is no worse here than it is on Valencia and Cardinal, on the south side of town." At the same time the City of South Tucson struggles with the reality that many of its residents live in poverty. The median family income hovers at just fifteen thousand dollars a year, less than half of that for those living in the city of tucson. That keeps volunteers busy at Casa Maria where every day they serve up nearly 700 lunches and send 200 bags of food home to families. Brian Flagg has presided over the operation since 1983 and also lives in the neighborhood. He likes the vibe, both good and bad, the contrast between poverty and culture. "So all those things come together and it provides for this uniqueness that is South Tucson," says Flagg. Ultimately it’s a struggle for survival of poor, humble, righteous people and that’s who I live around in the City of South Tucson." The Casa Maria mission not only feeds the hungry but has become a mecca in dispensing social justice. That flame burns bright in Maria Fuentes, who volunteers in the kitchen, but also walks the avenues inviting people to get involved in asserting their rights as citizens and insists that local government listen. Interviewed in Spanish, Fuentes says "we do it together. We go to houses and knock on the doors, what is it that people need in the City of South Tucson, and we plan together to interview people and voice their needs to the government." City government has listened, lending more attentive ears to the homeless population and working with the Primavera Foundation to rehabilitate and increase affordable housing where more than 60 percent of the city's population are renters. That has established a positive pattern of public private collaboration. Cajas sees that every time he mentors his cadre of Explorers, who on this day etch permanent VIN numbers on vehicles...a deterrent to theft. Says Cajas, "they see us out there doing positive things, it’s infectious. They in turn get involved in what we’re doing." That has had a great impact on his recruits, who he says in his eleven years as post commander have gone on to do great things. That has inspired them to feel confident about their futures. Clara Diaz studies criminal justice at the University of Arizona and aspires to become an agent for the FBI. As captain of the post she wants people to know that this is a hard working bunch, logging hundreds of community service hours each year, and winning multitudes of national competitions. "We’re respectful, hardworking. We’re loyal , we’re honest," says Diaz. "We worked a lot to get our name noticed because people noticed us as the City of Tucson, not the City of South Tucson. So we’ve worked hard to get our name noticed as the City of South Tucson." Meanwhile, more than 100 children compete for attention at the John Valenzuela youth center at the after school program, where Youth Program Director Jessica Alderate leads a group of a dozen or more second graders in a spirited hip hop. The center serves 150 children, although she wishes the they could accomodate more. Her principal goal is to convince these children that limited resources shouldn't limit their aspirations. "If we give them those tools to be leaders and go out and really pursue what they want to, then those are our future leaders," says Alderate. "It doesn’t matter what area you come from." That should make Richard Salaz proud, as he remembers his father, whose trio sang for three presidents. Sure, you can find argueably the best Mexican comida in the county. But you will also find children dancing.